At 1.94 pounds, the LaVie Z is the lightest 13-inch laptop in the world. But here's what's wrong. Ounces count in caviar, precious metals and the laptop that’s carving a divot into your shoulder while you’re standing in line for the plane. It’s these folks Lenovo is hoping to snag with its new LaVie Z, which claims the title of being the lightest 13-inch laptop in the world. I can confirm after receiving our unit for testing that yes, the LaVie Z is so incredibly light, at 1.94 pounds, you’ll initally wonder if it has any components in it at all. Hell, I wondered if Lenovo had shipped us one of those fake display laptops they use at the furniture stores. But Nerd’s Honor, this is a fully functional machine. Even more surprisingly, it’s fast—though you’d expect nothing less with a Core i7-5500U, 8GB of LPDDR3 and a 256GB Samsung M.2 SATA SSD inside. Lenovo’s new LaVie enters the 13-inch club (center) which includes HP’s Envy X360 (left front) Asus’ UX305 (right front) Apple’s Mac Book Air 13 2015 (rear left) and Dell’s XPS 13 2015 with QHD+ touch screen. The LaVie’s claim to fame is its weight. 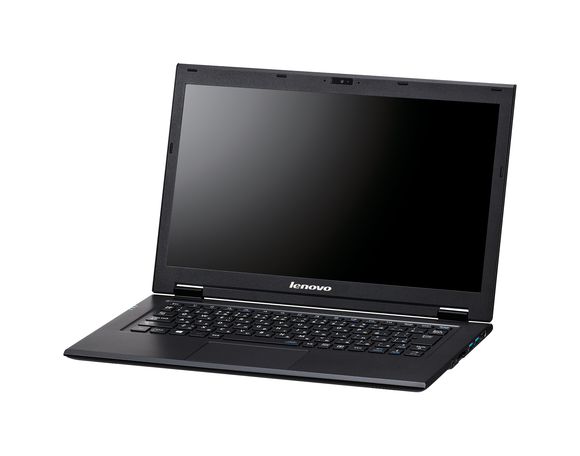 To achieve it, Lenovo (and NEC, which manufactured the unit through its joint partnership with Lenovo) made a lot of choices to shed ounces. The first is the shell, which Lenovo says is magnesium lithium. To keep it even lighter, the top deck is a single extruded piece rather than a two-piece assembly. Batteries also contribute a lot to laptop weight, so Lenovo opted for a high-resolution IGZO panel. IGZO (indium gallium zinc oxide) increases efficiency in how light is passed through the LCD display at high resolutions, and also in power leakage. Because the display doesn’t have to be driven as hard to attain the same brightness as other high-resolution panels, Lenovo was able to use a smaller battery for the LaVie Z than it would have needed with a typical IPS display. Rather than rely on manufacturer specs, I weighed each of the computers above on our obsessive-compulsive Pitney Bowes postage machine, in grams. All machines were weighed sans charger brick. Because I know the Surface Pro 3 mafia would chime in if I ignored it, I threw in the Surface Pro 3 with Type Cover and Pen. I also weighed the Surface 3 Pro without the Type Cover and Surface Pen too—which, frankly, makes it kinda useless. 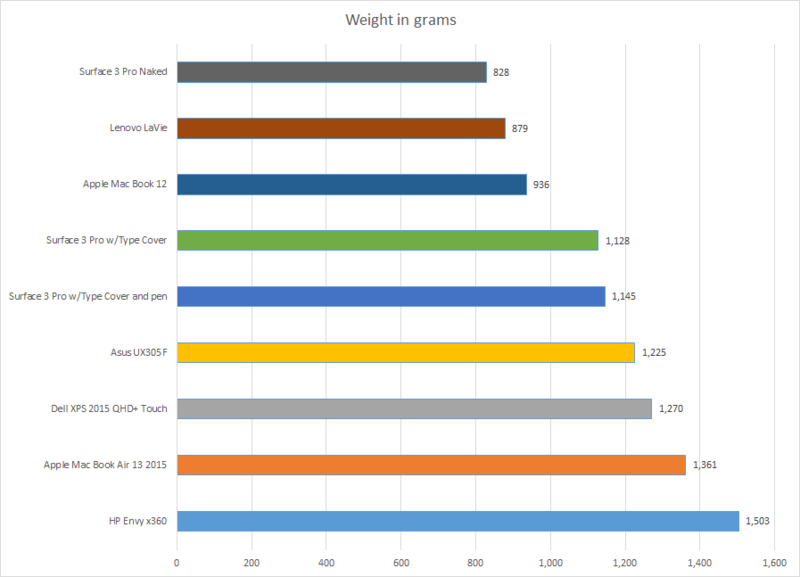 As you can see the LaVie Z is beaten only by the naked Surface Pro 3. Even Apple’s smaller Mac Book 12 is heavier than the LaVie Z. When you consider that the LaVie Z packs a bigger, higher-resolution screen than the MacBook 12, that makes Lenovo’s feat even more impressive. It’s also worth noting that some of the units are at a disadvantage here. The Dell XPS 13 without touchscreen sheds some weight, but still can’t touch the LaVie Z.
It’s how you use it right? The one inch difference between the LaVie and MacBook 12 looks sizable here and makes it even more amazing that the LaVie is lighter. As mentioned before, the LaVie Z is actually an NEC laptop and thus has a different look and feel than most Lenovo laptops I’ve touched. This is no ThinkPad. The lithium magnesium shell that helps save weight has quite a bit of give to it, for instance. I won’t say it feels flimsy, but pick up the HP Spectre x360, Dell XPS 13 or Apple MacBook 12—all feel solid, with no shell flex. The LaVie feels almost hollow when squeezed between your fingers. The good news is, structural integrity doesn’t seem to take a hit. I was able to do the classic “hold it by the corner” without feeling like the LaVie Z was going to fold up like an empty can of Budweiser. You can’t do that on all laptops. On the original Google Chromebook Pixel, for example, the corner test would render the trackpad inoperable occasionally due to body flex. The LaVie Z is obviously helped because it’s just so damned light. If you’re the cynical nerd who likes to scoff at the ridiculous claims of “audio by Harman / Beats / B&O” stickers on laptops, you’ll be happy to find there is no such certification here. Unfortunately that’s probably because no audio company would actually associate its brand with the LaVie Z’s poor audio. Yes, it’s that atrocious. Ultrabook audio tends to go from poor to awful. A few standouts include Dell’s current XPS 13 and HP’s Spectre x360. Both are adequately loud, and the Spectre x360 has better mid-range and low-end bass. The LaVie Z’s audio is so bad it’s hard to believe. I’m sure if I cracked the LaVie Z open, the world’s smallest and lightest kazoo player would wave back at me from inside. The keyboard is smaller than the other laptop’s I’ve seen and borders on unusable. While I found the trackpad with its slightly textured surface to be fine, I won’t say the same of the keyboard. I tried the early LaVie Z at CES and complained the keyboard wasn’t “Lenovo enough.” Unfortunately, not much has changed. The keyboard is smaller, and the keys tiny. It’s even smaller than the keyboard in the Dell XPS 13 2015, which I think is right on the edge of usability. I’ve been using an XPS 13 long enough to say it’s almost a deal-breaking feature on an otherwise spectacular laptop. I’ll say the same for the LaVie Z, but in this case it probably is going to be a deal-breaker for some. You’ll really need to try the keyboard first to see if you can live with it. I’m also not a fan of the keyboard layout, such as the function key in the lower left. 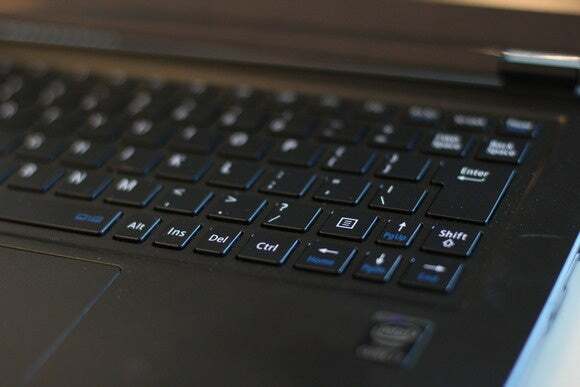 That’s where the Ctrl key goes, Lenovo! Yet other wacky keyboard decisions will require further acclimation. The LaVie Z makes some odd keyboard decisions. The LaVie Z’s display looks better on paper than to the naked eye. Its resolution of 2560x1440 amounts to 3.7 million pixels—right between the 2 million pixels in the 1920x1080 panel in the HP Spectre x360 and the 5.7 million in the Dell XPS 13 2015. When I measured the brightness, however, it maxed out at 235 nits—which just isn’t bright. The XPS 13 2015, for example, hits 400 nits. This could be another conscious decision by Lenovo/NEC to control power consumption, but it's disappointing regardless. The display quality varied. I didn’t see excessive bleeding from the backlighting, and compression banding was kept to a minimum. Backlighting evenness was mediocre, but that’s with the a white background on maximum brightness and in a darkened room--you’d be hard pressed to see it under “normal” conditions. I still judge the panels in the Dell XPS13 2015 and HP Spectre X360 to be better here. Viewing high-resolution images, I’d say the panel in the LaVie Z I have is under-saturated compared to the competitors. That may be a result of the anti-glare coating but I also found the off-axis viewing to be inferior to the competition. The LaVie Z’s Core i7 higher clock pays off as it’s faster than all other Ultrabooks we’ve seen to date despite its zany light weight. The good news? Performance is pretty awesome for something this light. I’ll start this off with our grueling Handbrake test that takes a 30GB, 1080p MKV file and transcodes it using Handbrake. 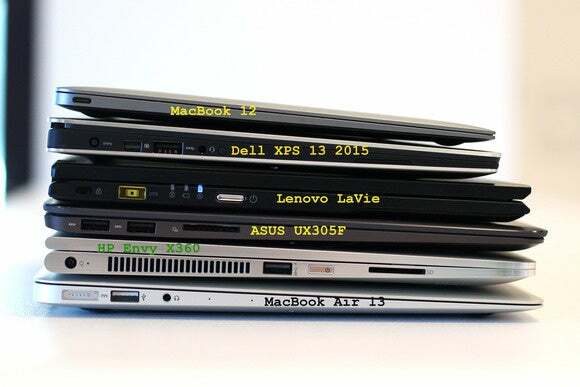 Not only does this show how well the CPUs in the laptops perform, but it also shows you what happens to performance under a heavy, long workload. You’ll see the same result from something that pushes the GPU for long periods of time. The Core i7-5500U in the LaVie Z turned in top performance and didn’t appear to suffer thermal throttling during our two-hour plus job. The chip is rated only slightly faster than the CPU in the next-best Dell XPS 13 2015, and this performance is pretty much in line that. You may not think thermal throttling is an issue, and in some ways it isn’t, because, you will feel it. You’re ostensibly upsold on “faster” laptops based on the pricier Intel chips inside. 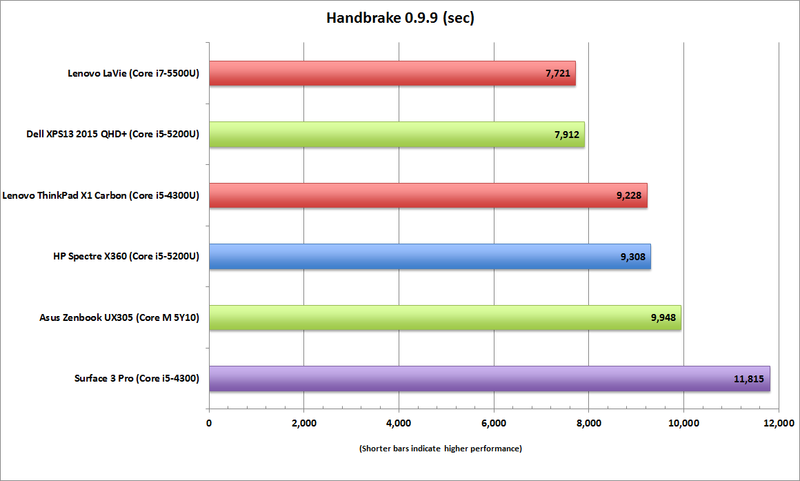 If your Core i5 is throttling you all the way down to Core i3 performance, what did your money get you? 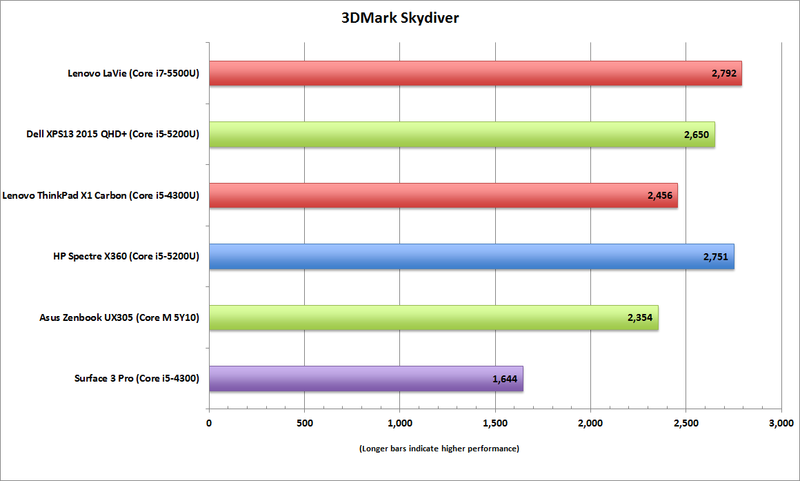 For example: The CPU in the Surface 3 Pro is the same as the ThinkPad X1 Carbon 2014 yet, its performance dive due to thermal throttling, as seen in the 3Mark skydiver results (above), iis significant. Despite being incredibly light, however, the LaVie Z doesn’t give up much in performance. The LaVie Z gives up decent battery life when you consider its weight and screen resolution. The most important performance chart for many will be battery life. I used BAPCo’s Mobile Mark 14 to measure how long the laptop will run under typical office drone tasks. By that I mean Office, Acrobat and other All Work and No Play tasks. 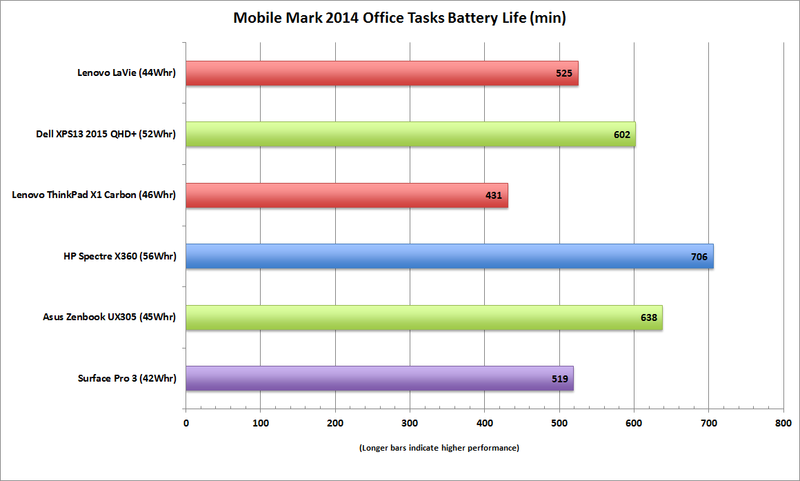 Mobile Mark 2014 tends to give you a best-case scenario in battery life for Office Drone work. It even lets off the laptop screen for a few minutes to represent a break you might take during use. 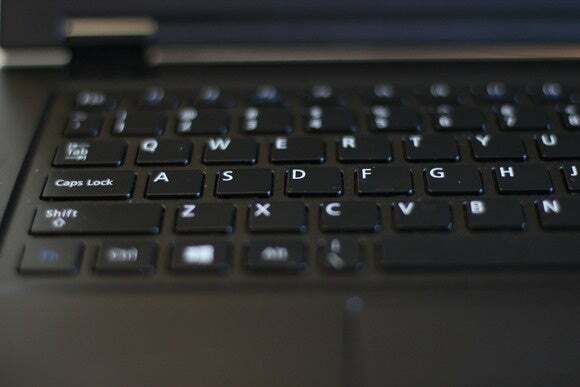 If you think about a laptop, the watt-hour rating is analogous to the gas tank on a car. As noted earlier, Lenovo/NEC opted to keep the battery size small to save weight. It’s a 44-watt-hour cell that’s about the size of the one in the Zenbook UX305 and the Surface Pro 3. Overall it achieved a fair run time considering the LaVie Z’s weight and resolution. It’s about on a par with the Surface Pro 3, which has a lower-resolution panel--but also a power-eating touchscreen. The Zenbook’s advantage in battery life is likely due to the Intel Core M and its lower-resolution 1920x1080 screen. It’s basically serviceable battery life. 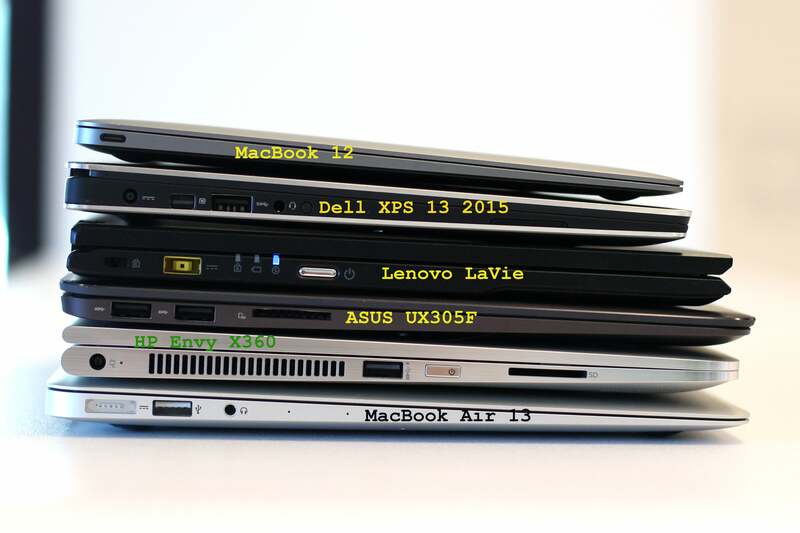 To see how the LaVie Z stacks up in ports we, um, stacked, up some leading laptops so you could see at a glance. 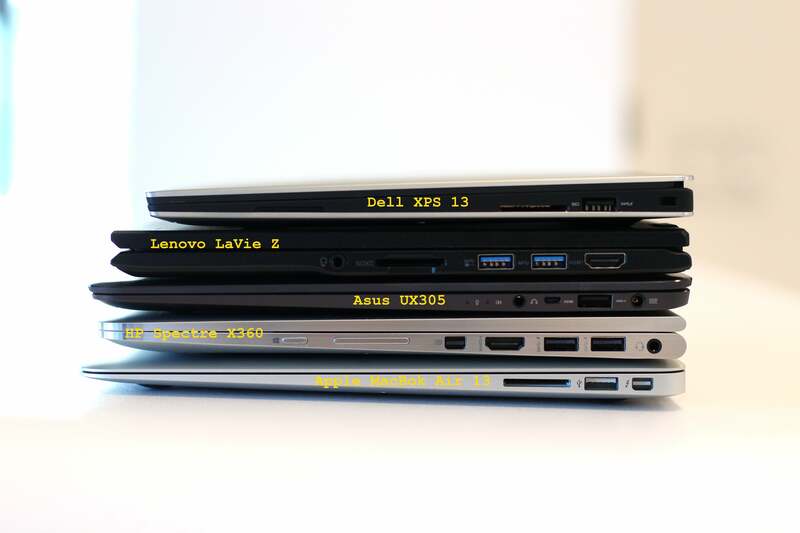 To give you an idea of the LaVie Z's thinness and port complements, we stacked it against a gaggle of other laptops. In port selection, it’s fair, with two USB 3.0 ports, HDMI 1.4 and an SD card reader. One thing I’m not a fan of is the power switch, which is oddly placed on the left side of the unit. That’s normal on a convertible laptop like HP’s Spectre x360, but why do this on the LaVie Z, where the screen doesn’t even rotate like that? We forgot to include the MacBook Air 12 right-side view, but it doesn’t matter since you’ve already seen the laptop’s only I/O port right? The last salient point about the LaVie Z is its cost. Spec’ed-out with the Core i7-5500U, 8GB of LPDDR3 and 256GB Samsung SATA SSD, it pushes $1,500. 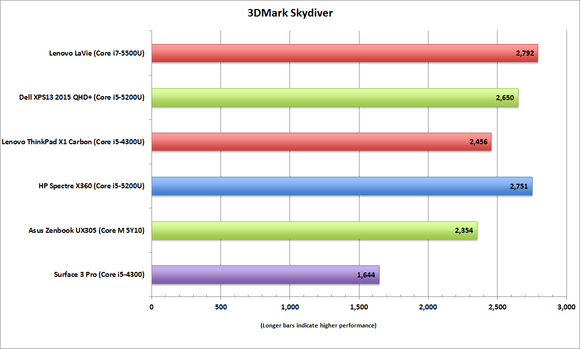 That’s a slight premium over its contemporaries, but much of that comes from the pricier Core i7 CPU. It’s true there’s no touch screen, but there’s also a price premium to be considered for the weight. Overall, the pricing is inline with comparable units that play to niche needs. The Lenovo is truly the lightest 13-inch laptop in the world but is it worth it? Lenovo’s aim with the LaVie Z was to make one crazy-light laptop. In that regard I can say the company accomplished that goal. You can chuck the LaVie Z in your bag and you won’t know it’s there. You may not think there’s a world of difference between the almost 900-gram weight of the LaVie Z and almost 1,300 grams of, say, the Dell XPS 13, but when you’re carrying it, it matters. The question is, are the compromises made worth it? The keyboard is almost a deal-breaker. I’ve used far worse, but those were on tiny netbooks or folding-tablet keyboards. Considering the size and cost of this laptop, Lenovo really should have put a bigger keyboard in the unit when it made the hop across the ocean. The audio is also truly atrocious. In the comfort of my cubicle yeah, it bugs me. But the next time I’ve been standing in line at the airport for an hour, maybe, just maybe, the tradeoff is worth it.